Taste test: This snack box contained seven individually wrapped bars of dark chocolate, each about the same length and half the width of a normal chocolate bar. 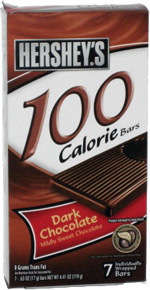 Each bar is 100 calories, so this style is good to pack in a lunch if you're watching your weight and don't want to eat a full-size bar. The dark chocolate had the same taste as a normal dark chocolate bar from Hershey's, so if you like dark chocolate, you shouldn't have any problems with this version. Smell test: For some reason, the smell of dark chocolate reminds me of pipe tobacco.